Last week, China purchased U.S. soybean and sorghum exports. 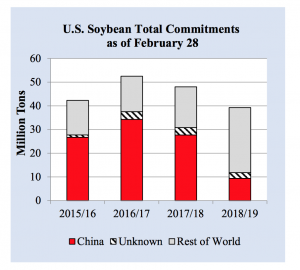 Nonetheless, farmers remained concerned about a trade resolution between the U.S. and China as more melancholy reports emerge about progress in the on-going negotiations. Reuters writer Karl Plume reported late last week that, “Chinese state-owned firms bought at least 500,000 tonnes of U.S. soybeans on Thursday for shipment primarily from Pacific Northwest grain export terminals from June to September, two traders with knowledge of the deals said. And Reuters writer Tom Polansek reported last week that, “China bought U.S. sorghum for the first time since August last week, U.S Department of Agriculture data showed on Thursday, fueling hopes for more deals as Beijing and Washington seek to resolve their trade dispute. Great news for U.S. sorghum producers: China has made its biggest purchase of U.S. sorghum since last year. I appreciate @POTUS and @USTradeRep fighting for our farmers and for achieving real results in trade negotiations with China. 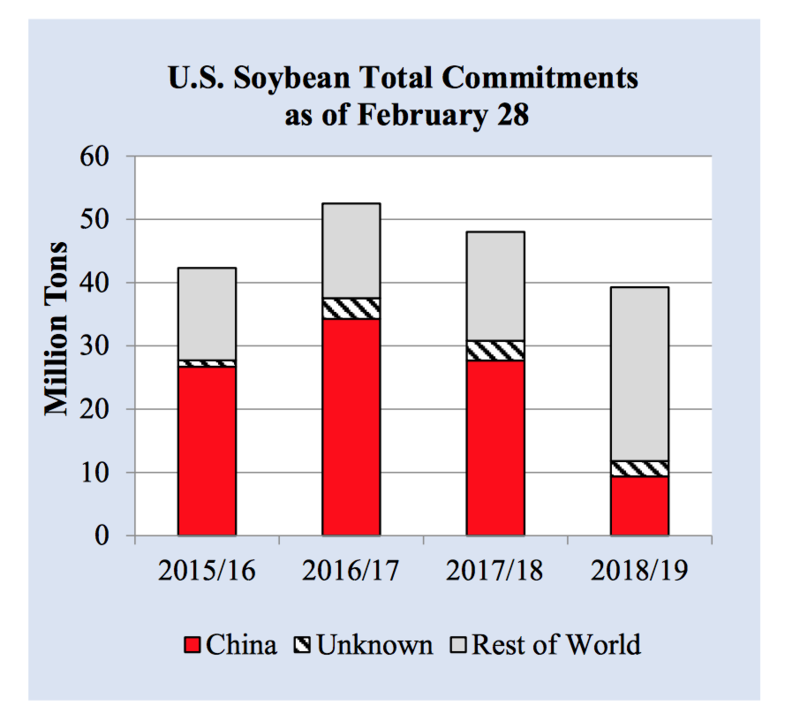 Also last week, Reuters writers Hallie Gu and Dominique Patton reported that, “China’s soybean imports in February fell to their lowest monthly level in four years, as buying slowed amid uncertainties over trade relations with the United States and flat demand for soymeal, customs data showed on Friday. In other news regarding U.S. soybean exports, USDA’s Foreign Agricultural Service (FAS) indicated on Friday (“Oilseeds: World Markets and Trade“) that, “U.S. soybean sales and shipments to the European Union (EU) have risen since April 2018, 2 months prior to the imposition of duties on U.S. soybeans by China. With premiums for Braziliansoybeans and with tight supplies in Argentina and Uruguay due to drought, EU buyers turned to the United States as the most economical and readily available source for soybeans. 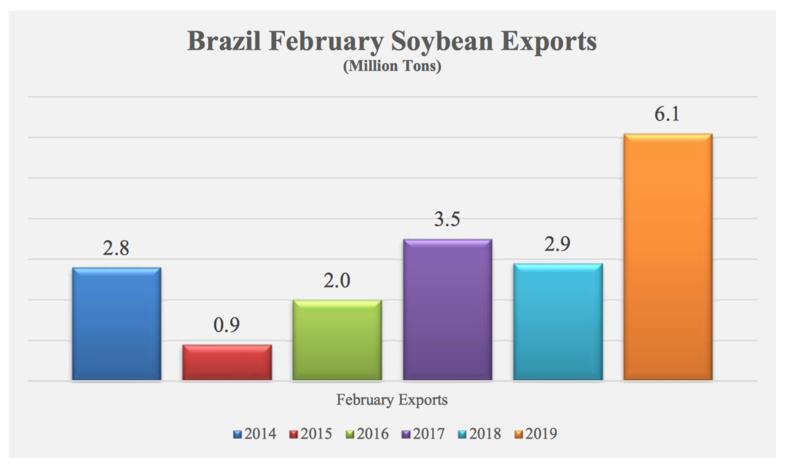 Using a 12-month moving total based on data obtained from the FAS export sales reports, soybean exports to the EU are over 9.0 million tons ending February. This is roughly double the amount exported through the end of February 2018. “Oilseeds: World Markets and Trade,” USDA- Foreign Agricultural Service (March 2019). On Wednesday, Reuters writer Humeyra Pamuk reported that, “So far, the American rural heartland that helped carry President Donald Trump to victory in 2016 remains largely supportive of his hard line on trade, saying unfair Chinese practices had to be addressed for longer-term economic gain. And Wall Street Journal writers Paul Kiernan and Josh Zumbrun reported last week that, “China’s move to cut off U.S. soybean purchases caused prices to drop midyear, when there is often a seasonal uptick, as China started buying a lot of soybeans from Brazil instead. That forced some U.S. farmers who had been holding on to their soybeans in hopes of better prices to sell at a loss, said Bill Gordon, who plants around 2,000 acres of soybeans and corn in Minnesota. 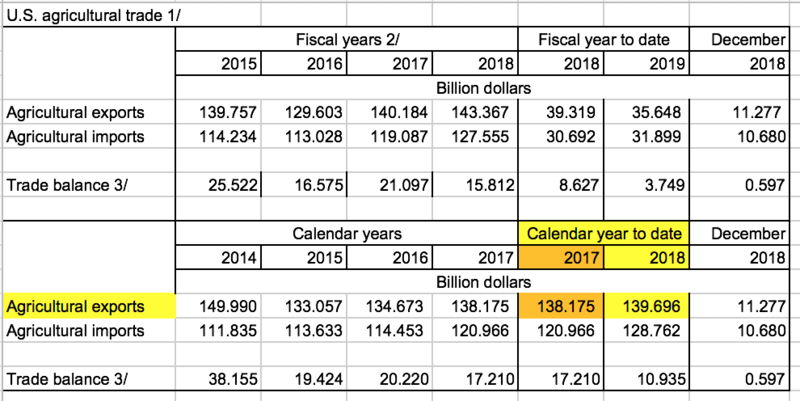 Meanwhile, USDA’s Economic Research Service (ERS) noted last week that, “Net farm income, a broad measure of profits, is forecast to increase $6.3 billion (10.0 percent) from 2018 to $69.4 billion in 2019,” and recent ERS trade data showed that the overall value of U.S. agricultural exports were slightly higher in calendar year 2018, than in calendar year 2017. “U.S. 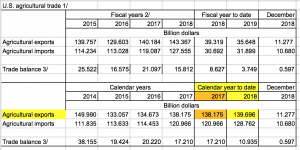 Agricultural Trade Data Update,” USDA- Economic Research Service (March 7, 2019- https://goo.gl/ndiHQi). “The biggest impact by far is likely to be on soybean suppliers. China imported 88 million metric tons of soy last year, valued at $38 billion, with Brazil overtaking the U.S. as the dominant supplier. “China’s Shopping List in America Has These Farm Goods at the Top,” Bloomberg News (March 6, 2019). 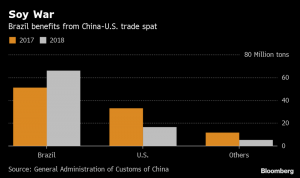 Lingling Wei, Jeremy Page and Bob Davis reported in Saturday’s Wall Street Journal that, “A U.S.-China trade accord is facing a new roadblock, as Chinese officials balk at committing to a presidential summit until the two countries have a firm deal in hand, according to people familiar with Beijing’s thinking. “A week ago, the sides appeared to be closing in on a draft accord. But Chinese leaders were taken aback by President Trump’s failed meeting in Vietnam with North Korean leader Kim Jong Un, the people said.